Gustav Friedrich (von) Hetsch (28 September 1788 – 7 September 1864) was a German-born, Danish architect. Hetsch was born in Stuttgart and studied at the University of Tübingen and in Paris, where his teacher was Charles Percier. After finishing his studies, he worked for Jean-Baptiste Rondelet on the Church of Sainte-Geneviève. In 1812 he was recalled to Stuttgart, but soon left for Italy, where he continued his studies and met the Danish architect Peder Malling. It was Malling who in 1815 inspired Hetsch to come to Copenhagen, where he taught at the Royal Danish Academy of Fine Arts, eventually advancing to Professor of Architecture. One of Hetsch's first major projects was the interior decoration of the rebuilt Christiansborg Palace, where Christian Frederik Hansen was the principal architect. 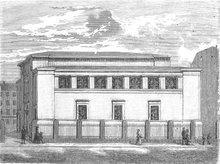 Though most of his accomplishments were in the area of decorative art, Hetsch also designed the Great Synagogue (1833) and St. Ansgar's Church (1842) in Copenhagen. In parallel with his duties at the academy he held several other positions, including that of artistic director of the Royal Porcelain Factory (1828–1857). The Great Synagogue in Copenhagen, 1899. St. Ansgar's Cathedral in Copenhagen, 2007. Kjeld von Folsach (1988). Fra nyklassicisme til historicisme: arkitekten G.F. Hetsch [From neoclassicism to historicism: the architect G.F. Hetsch]. Copenhagen: Christian Ejlers. ISBN 978-87-7241-966-4. Retrieved 9 March 2010. "The Soul in Nature — The Danish Golden Age 1800–1850". 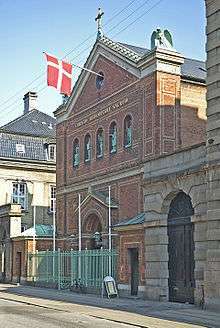 National Museum of Denmark. Retrieved 9 March 2010.